Julia Child, Jacques Pepin, Alton Brown. We imagine these names when we think of the great chefs throughout TV Cooking Show History. But forget all of that, because today we're going to focus on the other side of the spectrum. 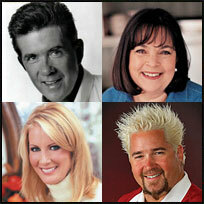 Think Sandra Lee, Paula Deen and Alan Thicke. These Julia-wannabes have been clogging up our airways for the last thirty years or so, from the moment that the Great Cable TV revolution bestowed fifteen minutes of fame onto just about anyone with a pretty mug and a stainless steel spatula. Browse through our list of Cooking Show Catastrophe's and see if you don't agree that we'd all like to get back that thirty minutes spent watching barbecued shark before bedtime. Want to read about a more uplifting set of shows? Check out the 100 Best Cooking Shows of All Time here. Enjoy the list. And, by all means, avoid the shows. Bitchin’ Kitchen belongs on that list. And Five Ingredient Fix should have been a finalist. Claire Robinson is every bit as repulsive as Paula Deen. The Neeleys definitely belong on the 30 Worst list because of their silly dialogue and behavior on the show. If you want to write professionally, you might want to learn the definition of “buxom,” the correct usage of “substitute,” and why it’s a good idea to make subject, objects, and verbs agree in terms of pluralization (i.e., X and Y ARE the “means” and “ends” — and the reason it’s a good idea is that if you don’t do this, your writing is subliterate). Additionally, if you want to write about food, you might want to discard the hackneyed old stereotypes about English food and actually taste some. I think that “Chopped” should be in there somewhere, or at least #31. The show is the final unmistakable sight that Food Network has run the whole “cooking contest” format/reality show right into the ground. I fully intended to read your list but you began with Barefoot Contessa on a list of BAD cooking shows and that really makes me question your judgment. Thank you for pointing out the obvious!!! I could not agree more with your list. I would like to add one if I could. Bitchin’ Kitchen. My friend and I stumbled across this one evening and thought it was a Saturday Night Live episode. I found my mouth wide open in complete shock. The episode we saw was ‘the Break up meal’ It’s definitely worth the watch. Justin Wilson and his affectations as authentic Cajun? Hell’s Kitchen and the Neely’s on the ‘Best’ list, Ina Garten on the ‘Worst’, and an altogether MIA Sara Moulton??? In defense of Ina, Sara (and Giada), every dish I’ve tried has turned out great and I’ve learned something from all of their shows. Of course best and worst lists are all highly subjective. I disagree with some on the list. I think it’s great that there are so many varieties of cooking shows out there. Let’s face it… we can’t have every show looking the same — people are NOT interested. I am glad that a younger generation of people are getting into cooking and some of these shows do just that. I like to think of myself as open-minded… some of you should try that. P.s I really love Bitchin’ Kitchen… loosen up a little! I’m curious to know which shows the author thinks are good shows, as almost every cooking show on TV is on this “bad” list………?? I am surprised at Great British Menu being on the list. It is probably one of the few shows that actually focuses on cooking and not the drama. It is entertaining in that it pits real Michelin starred chefs against each other for an honor cause and not for money or some other materialistic prize. Though British cooking gets a bad rap, it has some of the best chefs (for example, the Roux family) some of the finest restaurants in the world (The Fat Duck for one) and no less than 143 Michelin Stars. To hate on this, finest of food shows, makes me wonder if you’re ranking by drama and not by actually anything related to food. It is a delight to see that the chefs get a proper amount of time to create and perfect a dish instead of some silly challenge that requires them to make a 3 star meal out of yesterday’s garbage in less than 30 minutes. This show allows for the viewer to get a peek at some of the greatest chefs at work while getting an idea of their ideologies and influences. The BBC site even gives out the recipes for the more adventurous to try at home. I would recommend you try rewatching the series again and without the bigotry. LMAO! Your pick for #1 is on the money… I would push SL down a flight of stairs if I had the chance! I disagree with Barefoot Contessa and Top Chef, however. The former, because I love how she makes a mess and I’ve never made a recipe of hers that wasn’t delicious. Top Chef is just fun! Wow, super harsh! I personally love Ina Garten’s show, I find her voice relaxing and not the least bit condescending. Where is “Diners, Drive-Ins, and Dives”? I don’t think there’s a redeeming quality to Giada, but Paula? 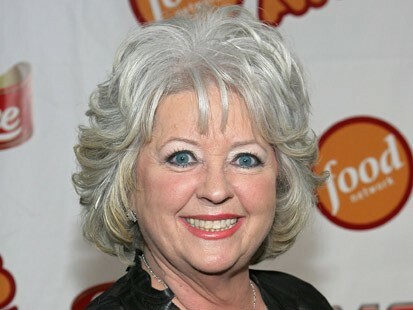 Paula is Food Network queen! Yes, her foods are fatty and terrible for you, but how can you deny that the woman’s entertaining, and knows her stuff? And I gotta say, I love the competition shows (Next Food Network Star namely).